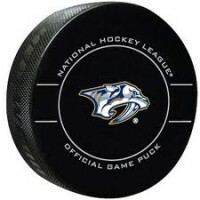 Then Filip Forsberg gave Nashville a two goal cushion at 14:35 of the second period, taking a pass from Nick Bonino, then attacking the net and tucking the puck by Bishop and the Predators had a 2-0 lead. Then with under three minutes remaining in the period, Mats Zuccarello took the puck to the net on Rinne, slipping it between the goalie’s legs and Dallas cut the lead in half, 2-1. When the third period began you could sense the momentum had swayed in the Stars favor as the crowd was back in the game. The period began with a Dallas power play as Austin Watson was flagged at the end of the second. At 8:15 of the final frame, Tyler Seguin drove the net and buried a sick feed from Jamie Benn to tie the game, 2-2. The line of Seguin, Benn and Radulov spent a lot of time on the ice tonight for Dallas, trying to catch the Predators with tied legs, or in a line switch. At 11:41 of the third, Mikael Granlund took the puck from the blue line and spins and fires a shot that deflected off Ben Bishops blocker and into the net, and suddenly the Predators had them a “dirty” goal and took the lead for the final time, 3-2. Noticeable stats in tonight’s game include how Dallas outshot the Predators 42-28. Rinne blocking all but two shots on the night, while Bishop blocked 25. 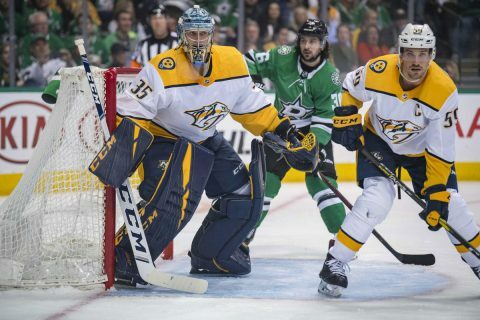 It’s also notable that Dallas was flagged for only one penalty, while Nashville was sent to the box four times on the night. The Predators had to fight off a 5 on 3 power play to keep Dallas off the scoreboard. These two teams lock horns again on Wednesday night. Puck drops at 7pm. Nashville will return to the Bridgestone Arena on Saturday night for game five.